From LaraCaroline here's a great peice of Dame BlackStone (aka Harry BlackStone Copperfield Dresden) in her new demon form. This is from my fic "Bood Debts"
I have been reading way too much KanColle fic lately. I first wondered if this was the latest Re-class remodel, then remembered that their tails are heftier. 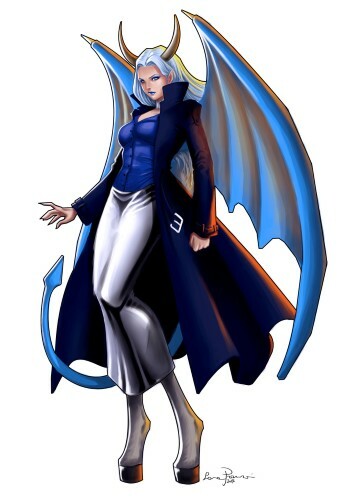 [Nah, she's a Return style succubus. [Heh, the size of her horns is a bit of an inside joke. [See in the story horns are part of a sense organ, that's used to pick up energies, emotions and the like from others. As a species these demons are highly empathic. [And as a human Dresden is pretty gormless and doesn't always get people.